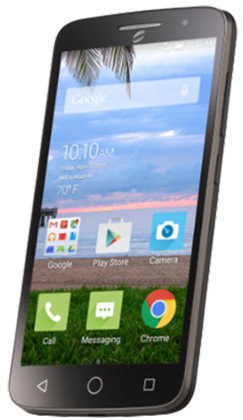 Alcatel OneTouch Pop Icon 2 A846L is a 5-inch smartphone running Android 4.4 KitKat powered by a powerful quad-core processor. It is a follow-up of the entry-level Pop Icon from Alcatel. The two have almost similar features, the difference being the Alcatel Pop Icon lacks 4G LTE while Alcatel Pop Icon 2 A846L is 4G LTE enabled. It’s also known as Alcatel A846L or Alcatel OneTouch Pop Icon II LTE. This being a CDMA phone it activates on Verizon towers. For an entry level gadget, I liked the display size and especially the fact that it is 4G LTE enabled, hence fast internet speeds. Alcatel OneTouch Pop Icon 2 A846L is a prepaid CDMA phone available from Straight Talk or Net 10 Wireless websites. Opening the box, we have the Alcatel gadget, battery, a wall adapter, a standard USB cable, battery, a pair of headsets, activation card, and service manuals. Installing the battery and doing the initial setups is pretty simple, I was done in under 10 minutes. I will go straight to the design. Alcatel OneTouch Pop Icon 2 A846L is a 5-inch device with rounded corners. The outside cover feels rubberized, although it's plastic. The back cover is removable - which gives you access to the battery and also the microSD and SIM slots. The exterior design and layout of buttons is kind of typical. Both the power and volume buttons are located on the right-hand side of the device. At the bottom of the device, we have your mic as well as the USB port for charging and USB file transfer. Your headphone jack is located on the top side of the device. The back cover holds the primary camera with a LED flash as well as your main speaker. Coming to the front, you will find a 5-inch capacitive display. The upper part of the display we have the front camera. The lower part of the screen, we have the navigation buttons. The arrangement of the three navigation buttons; the back button on the left, home button at the center and the recent apps button on the right. One thing that stands out is the large display and the rubberized texture when you hold the phone. Alcatel OneTouch Pop Icon 2 A846L comes with a 5MP back camera and a 0.3MP front camera. The back camera has a LED flash so you can take some shots in low light environments. It can capture videos, and you can as well apply filters on photos taken. The camera also has some pretty amazing features like live filters, digital zoom, night mode, auto-focus, geo-tagging and face detection. The front camera though short on pixels comes in handy when you need to take selfies. It also supports video calling. Imagine 5-inch screen size on an entry level phone. The Alcatel OneTouch Pop Icon 2 A846L gives you exactly that, at a resolution of 540 x 960 pixels. Photos and videos show up clearly on this device; I actually enjoy watching content from YouTube or browsing through the phone gallery. A larger display also makes reading files on PDF and other document processing apps less of a hustle. Operating with one hand is easy on a 5-inch device, while in landscape mode, it provides a perfect media viewing experience. For the time I have had the phone, the 2000mAh capacity battery has served me well. 14 hours of talk time and 18 days of standby is pretty good, given it has a slightly larger screen. When playing games and intensive browsing, I have had to recharge some hours into the day. But with typical usage like texting, making calls, or replying to emails the battery survived through a day. Alcatel OneTouch POP Icon 2 A846L ships with 8GB of internal memory. This is some considerably large storage capacity. It is more than you would expect to get on a device at this price point. Additionally, the device comes with a dedicated microSD card slot that you can use to expand the storage up to 32GB with an external memory card. Alcatel OneTouch Pop Icon 2 A846L ships running Android 4.4 KitKat. It's powered by a Qualcomm Snapdragon Quad-core processor running at 1.2GHz. Onboard the device is 1GB of RAM. Alcatel includes Adreno 306 GPU on this gadget to handle graphic matters like video playing and gaming. This helps bring out clear videos, and also when gaming, characters appear sharp with no noticeable lag in animations. The phone is incredibly responsive for a midrange device. Since it has a quad-core processor, you can be sure to run most intensive apps without experiencing any lagging. Apps like Google maps load faster and I found it quite responsive on zooming in and out. It's super-fast on internet speed. The 4G LTE capability ranks it high on entry-level devices and is one of the impressive features on this Alcatel Pop Icon 2 A846L . Watching YouTube videos with no buffering on the 5-inch display is something I loved, and I believe you would too. The sound quality is also great. Switching between apps is pretty fast. It has the recent apps' navigation button that brings in an element of multitasking which is impressive for an entry-level device. I have no issues with the phone and the overall performance is way above average for a phone in its price range. The phone comes installed with several apps ready to use. Mostly the Google apps like Gmail, Maps, Hangouts, Google Plus, and Google Play are installed. You can still install more apps from Google Playstore. Other connectivity features on the phone include Bluetooth 4.0, Proximity sensor, GPS for location services, and Accelerometer for controlling the phone by tilting or shaking. 5MP back camera, 0.3MP front camera. Battery Capacity: 2000mAh. Talk time up to 14 hours. Standby time 18 days. Internal storage capacity 8GB. Expandable up to 32GB with microSD. 5.55" (H) x 2.8" (W) x 0.38" (D) inches. Qualcomm Snapdragon 1.2 GHz Quad-Core Processor.